Den Hartog Industries is excited to introduce new additions to our Stackable Tote line. 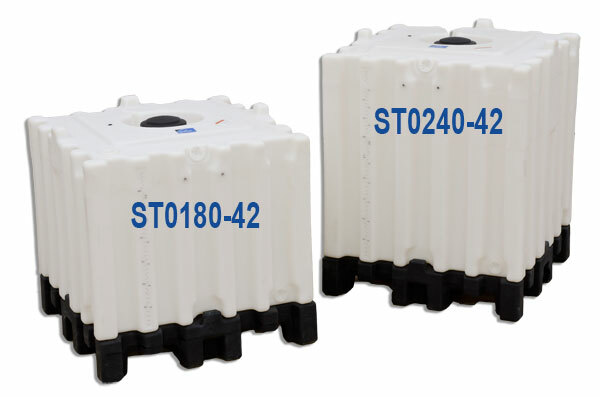 Now available are 180 & 240 Gallon Stackable Totes! Stackable Totes are freestanding totes for indoor or outdoor, stationary or transportable applications. Most popular uses for these tanks include fresh oils, washer fluid and other automotive fluids. 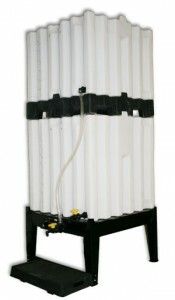 Designed for the containment of liquids with a specific gravity of 1.5 or lower. 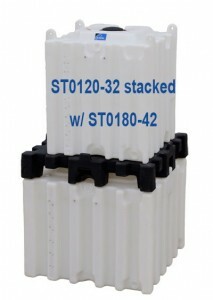 A 4-way, forklift accessible, Tote Adaptor is available for handling the totes. It also serves to adapt the 35, 70 & 120 gallon Tote sizes to the 180 & 240 gallon Totes. A 24″ Stand is available for elevated applications. It is manufactured from welded mild steel and features a black powder coated finish. A polyethylene Drip Tray provides a tray and spill guard for fill containers. The kit is adjustable for various container heights and a stainless expanded metal drip screen is provided for drain through. To view product and accessory prints please visit the Stackable Totes and Stackable Tote Accessories sections of our website.